I joined Eyeem in this week. I konow Eyeem from my friend's facebook wall. Similar to Instagram, Eyeem is a site that displays photographs. The difference is we can sell photos on Eyeem's market. When your photos selected for Premimum Collection, your photos will sale on EyeEm Market. It was also selected for distribution to Getty Images and other partners via the Premium Collection. EyeEm started in 2010 at the cusp of the mobile revolution, when it suddenly became possible to empower a new generation of photographers to break new ground. What started as a modest blog with pop-up exhibitions in New York and Berlin turned into a devoted group of 20 million photographers across 150 countries. Here's my Premium Collection on Eyeem's market. 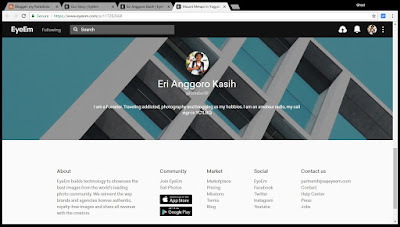 How to join Eyeem ?. Whilst uploading a photo, simply select the box at the bottom of the screen to make your photos available for sale. Thank you for comments and all comments will publish after moderation.